In 2-quart saucepan, melt butter over medium heat. Stir in frozen vegetables; cook 3 minutes. Sprinkle flour over vegetables; stir well. Cook 1 minute. Beat broth into vegetable mixture with whisk; cook over medium-high heat, beating constantly, 2 to 3 minutes or until thickened. Stir in chicken, whipping cream, salt and pepper; continue cooking 2 minutes. Remove from heat; cool 10 minutes. Meanwhile, unroll crusts on work surface; lightly roll crusts to make slightly larger. Cut 5-inch diameter circles in crust, reserving scraps to reroll to cut a total of 8 circles. Place on 2 ungreased large cookie sheets. 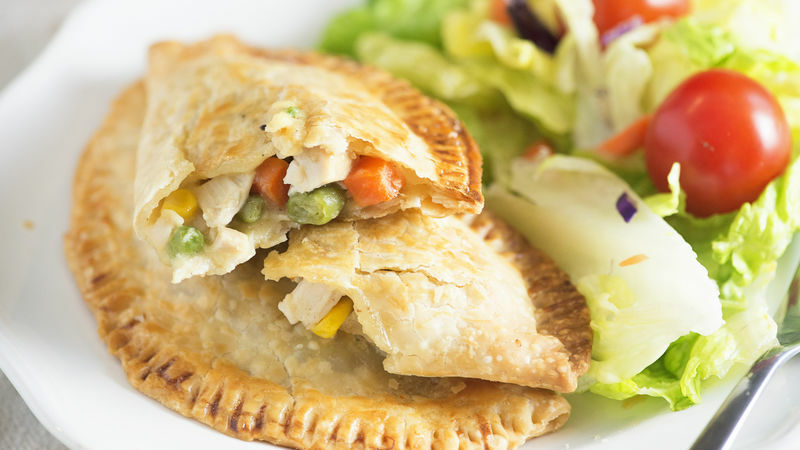 Spoon 2 to 3 tablespoons chicken filling into each crust; fold over. Press with fork to seal. Cut smaller circles of pie crust to make mini turnovers for a fun appetizer! Place a bowl upside down on pie crust, and trace it with a sharp knife to cut perfectly shaped circles.